Published: May 31, 2018 · Modified: Apr 11, 2019 · By Jen Sobjack · This post may contain affiliate links. A step-by-step guide for How to Make Brownies that will give you fudgy, chewy brownies in no time at all. I am a sucker for a dense fudgy brownie. Every single brownie recipe on my blog is stick to your teeth fudgy but today’s simple brownie recipe is more on the chewy side. I took my favorite brownie base, the one I used for these double chocolate brownies and modified it until I achieved a chocolatey, chewy brownie. It’s hard for me to sway from my beloved brownie recipe. It’s the base for chocolate cherry brownies, Nutella Brownies, and candied pecan brownies. It’s really the only brownie recipe I use. I love this new recipe I’m presenting to you. There’s so much chewy chocolatey goodness here. I used less chocolate than I normally would. More chocolate equals a fudgy brownie but I was going for chewy. And the best part is this brownie recipe comes together in just one bowl just like my easy vegan brownies. How long do you put brownies in the oven? Bake brownies for about 25-30 minutes, or until a toothpick inserted in the center comes out with a few moist clumps clinging to it. There will also be a little batter stuck to the toothpick but it shouldn’t be covered in thick uncooked batter. Take care not to overbake brownies. Butter – is necessary for a rich, chewy brownie. Chocolate – use both melted baking chocolate and cocoa powder. Sugar – not only will sugar add sweetness, it will also melt during baking and help with the chewiness. 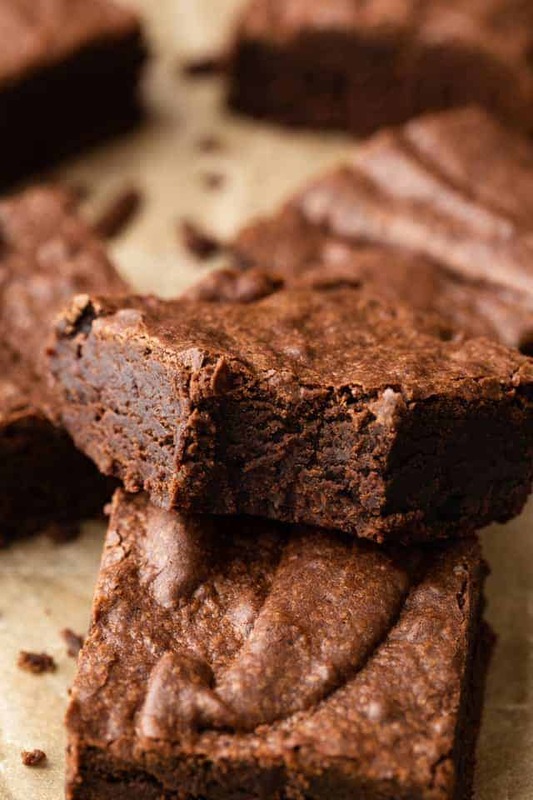 Flour – the more flour you use, the cakier a brownie will be. Typically I use 1 cup of flour for super fudgy brownies but for this recipe, I added 1/4 cup more. Eggs – the main structure of brownies. I also added an extra egg yolk to get more chewiness. Melt the chocolate and butter in a heatproof bowl set over a pot of barely simmering water. Keep stirring as it melts. You can also use a microwave safe bowl and heat in 30-second intervals stirring in between until fully melted. It’s important to add the sugar while the melted chocolate is hot. The sugar will melt ensuring the baked brownies aren’t grainy. Let the chocolate mixture cool before adding the eggs so they don’t scramble. Then whisk them in really well with the vanilla. Add the flour and cocoa powder then use a silicone spatula to fold it in just until it’s incorporated. Take care not to overmix. Bake the brownies for 25-30 minutes in a 350°F oven. Use the toothpick test to check for doneness. There should be a little batter and a few moist crumbs clinging to the toothpick. Let the melted chocolate cool before adding the eggs so they don’t scramble. Also, make sure the eggs are at room temperature so they are easy to mix in. Sift the flour and cocoa powder to remove any clumps. This will make it easier to fold in. 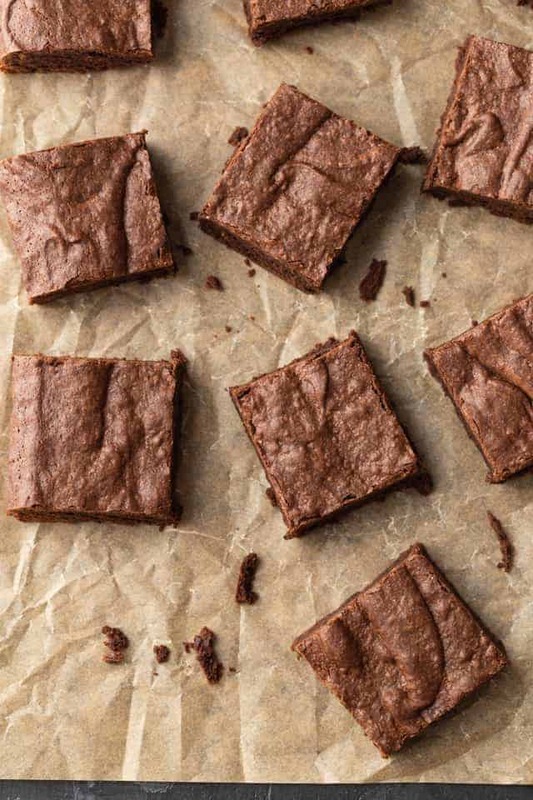 Use a light-colored metal pan for baking brownies. They heat slower and more evenly. Don’t overbake the brownies. Use the toothpick test as instructed above. Ultra chocolatey and chewy, this easy brownie recipes requires only 1 bowl, a whisk, and a spatula. Preheat the oven to 350°F. Line an 8×8-inch pan with parchment paper or aluminum foil, leaving a 1-inch overhang on all sides. Spray lightly with nonstick spray and set aside. In a medium heatproof bowl set over a pot of barely simmering water, melt the chocolate and butter, stirring constantly until the mixture is smooth. You can also microwave in 30-second intervals, stirring between each one. Whisk in the sugar while the chocolate is still hot and set aside to cool slightly. Add the eggs, egg yolk, and vanilla. Whisk until the batter looks smooth and shiny, about 1 minute. Add the flour, cocoa powder, and salt. Use a silicone spatula to fold until no visible streaks of flour remain. Spread the mixture evenly into the prepared pan and bake for 25-30 minutes or until a toothpick inserted into the center comes out with a few moist crumbs clinging to it. Cool on a wire rack to room temperature, about 2 hours, then remove from the pan and cut into squares. Brownies can be stored at room temperature in an airtight container for up to 1 week. Brownies can be frozen for up to 3 months. Thaw in the refrigerator overnight and bring to room temperature before serving. This recipe doubles easily. Bake in a 9×13-inch baking pan for about 35 to 40 minutes. I’m trying this recipe out for the second time but it’s not working for me. I don’t understand what I’m doing wrong. The moment I add granualated sugar it’s gets clumpy. Can you please help me. Make sure the chocolate is warm when you add the sugar and just keep whisking until it’s mixed in. 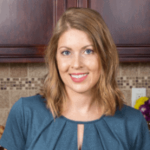 Jen, thank you so much for this recipe! I made this Brownie and it’s perfectly tasty and was easy to prepare. Saved to my favorites! Yay! It’s one of my favorites too! Glad you enjoyed them.